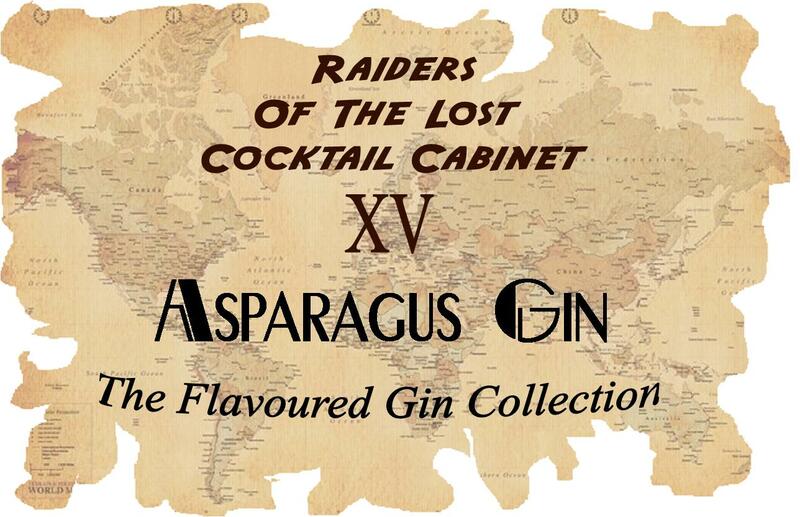 During our series of articles on Raiders of The Lost Cocktail Cabinet, an indispensable resource has been the website cocktaildb.com. This was the website that I was using whilst researching Mint Gin when I found the picture below. Yes, as the picture suggests, it is Asparagus Gin and it was made by FOLSOM ASPARAGUS GIN CO. of San Francisco. Further information on the company is very limited, although I did find out that it only existed from 1916-1918, so obviously the population of the Bay area were not that fond of this unusually-flavoured gin. This may seem like a very unusual flavour to use in liquor but the aperitif Cynar is heavily flavoured with Asparagus. In the spirit of experimentation, I decided to recreate this gin using my usual, simple method, i.e. by steeping some washed and cut (uncooked) asparagus spears in gin for about two weeks. I found it interesting at, during this period, the spears firstly sank, then rose to the surface and then sank again. Anyway, I digress… After leaving the asparagus spears in the gin for two weeks, I strained and bottled the results. So how did it taste? Light green in colour, similar to green chartreuse. Nose: It is unusual and, initially, I did gag reflexively, but – afterwards – I got a little saltiness and some starchiness, similar to potato rosti. The overwhelming smell, however, is that of fresh asparagus. Taste:It does what it says on the tin: it tastes strongly of asparagus, with a little dry juniper at the back. It’s certainly savoury, with some definite saltiness. It also had a strong finish. Mostly due to the saltiness, I found it difficult to finish a glass, although Mrs. B found it “passable”. I think this is the ultimate test for any gin. Surprisingly, this gin actually works in a G&T! If you put it with a more herbal tonic (1724 or Fevertree Mediterranean), it is even better! Fresh and savoury, with some spice, too. The asparagus comes through quite strongly, but it works well. An unbalanced mess, not recommended. Hard to stomach. I’m not a big fan of Bloody Mary’s, but this is not bad at all; the asparagus works well with tomato and celery as they are all quite savoury. I must get a friend who is a big Snapper fan to try this. Regular readers of our experiments may be surprised that we only tried 4 cocktails, but, in all honesty, some of these were pretty horrible. The one exception was the Gin & Tonic, which worked quite well. 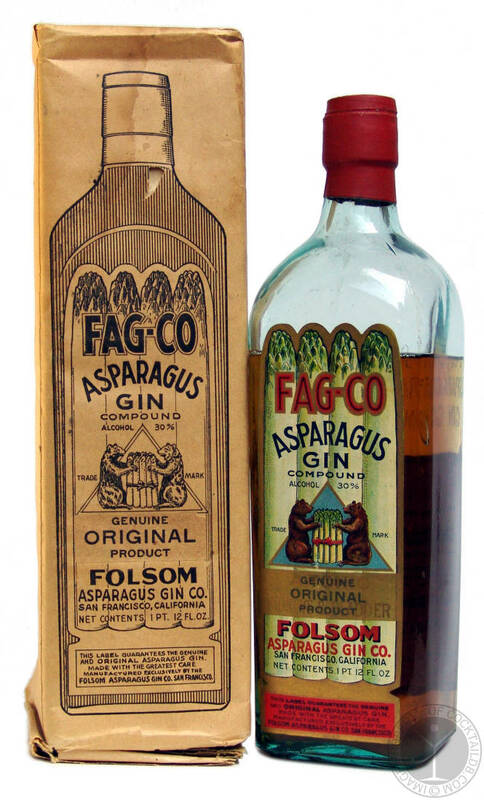 The Fag Co. Asparagus Gin lasted for only two years; maybe this was because, at that point in the early 20th Century, the Gin & Tonic was an almost unknown drink in the USA?